After playing at the Orange Tree in 2017, this award-winning production by Brandon Jacobs-Jenkins An Octoroon comes to the National. Bravely and provocatively this play deals with colourism, racism, and slavery, it’s a roller coaster production that warrants laughter as humour is injected by the bizarre: like when Kevin Trainor in Redface performs a Cherokee Indian dance to hip-hop music. the bizarre takes darker tones when the two black female slaves (Vivian Oparah and Emmanuella Cole) dress up for the slave auction, considering the sexual violence suffered by black women during American slavery. An Octoroon warrants questions like, what does it mean to be a black playwright? A far-reaching question that has been asked for almost a century, Hughes, Hansberry, Wilson, Morissaeu, the list goes on, playwrights whose social identity and the dramas they write cannot be separate. An Octoroon was recently listed number two in the New York Times article “The 25 Best American Plays Since ‘Angels in America”, opens within a metatheatrical frame, lead Ken Nwosu as BJJ (Brandon Jacobs-Jenkins) addresses the audience about the difficulty of finding white actors to plays roles that they now deem racist. His solution whiteface. As he recalls the conversation had with his therapist (maybe imaginary) he applies whiteface. There is whiteface, blackface and redface throughout the play, which the male actors also use to switch characters. The female actors do not switch character or race. An Octoroon maintains the plot of the once very popular The Octoroon by Irish playwright Dion Boucicault described as an “engagement with race”. The Octoroon was about slaves and their masters set on a Louisiana cotton plantation. Jacobs-Jenkins handles this revamp of Boucicault’s 1859 melodrama with an almost in your face effrontery that laughs at the deplorable notion of colour being a vehicle for superiority and inferiority. Furthermore, the play deals with “blackness” looking at the “complicated position of biracial men and women”, when Zoe is sold at auction her price is far higher than the other slaves, but she is still sold, and she is still a slave. So, what is the backstory? An accomplished Nwosu also plays with skill both white hero plantation owner George and white villain the evil M’Closky. Technique must be admired when the two characters enter a fight, cleverly choreographed as Nwosu jumps back and forth fighting himself. Nwosu as the young white George, returning from Paris, falls in love with Zoe (Iola Evans) who is an ‘octoroon’ – a black slave who is white-passing. The slaves and the plantation are about to be taken by away by debtors. A difficult decision must be made by George whether to marry the tainted Zoe or the rich white heiress Dora (Celeste Dodwell). Marrying Dora will save the slaves. But there is tension and rivalry for the attentions of Zoe – a villainous suitor who will do anything to have her including bidding for her at auction. In director Ned Bennett’s production – a transfer from the Orange Tree Theatre An Octoroon, in one of the last scenes a white sheet is dropped down from the ceiling with images of lynching. Is the play meant to shock? Yes. Does Brandon Jacobs-Jenkins deliver an entertaining piece? Yes. Provocative because he makes the audience deal with what they rather not see or talk about or feel. A stellar cast take on a layered text that one might conceive as easy to deliver from their faultless performances. An Octoroon is on at The National Theatre running from 7 June to 18 July, a co-production with the Orange Tree Theatre by Branden Jacobs-Jenkins. 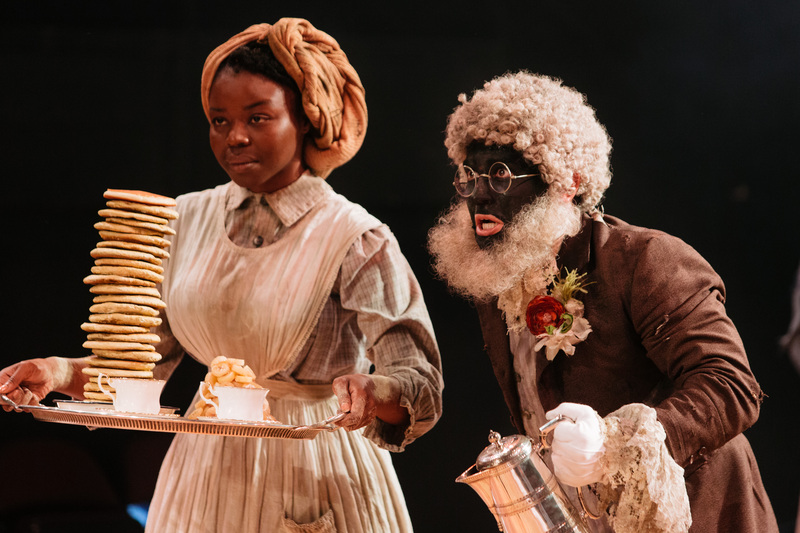 Image credit: Emmanuella Cole, Alistair Toovey in An Octoroon at the National Theatre. Helen Murray. Running Time: 2 hours 40mins approx.